Children's Hospital Oakland and Highland Hospital are trying to shift the paradigm of urban medicine by tackling some of the root causes of illness — like the lack of housing and food. 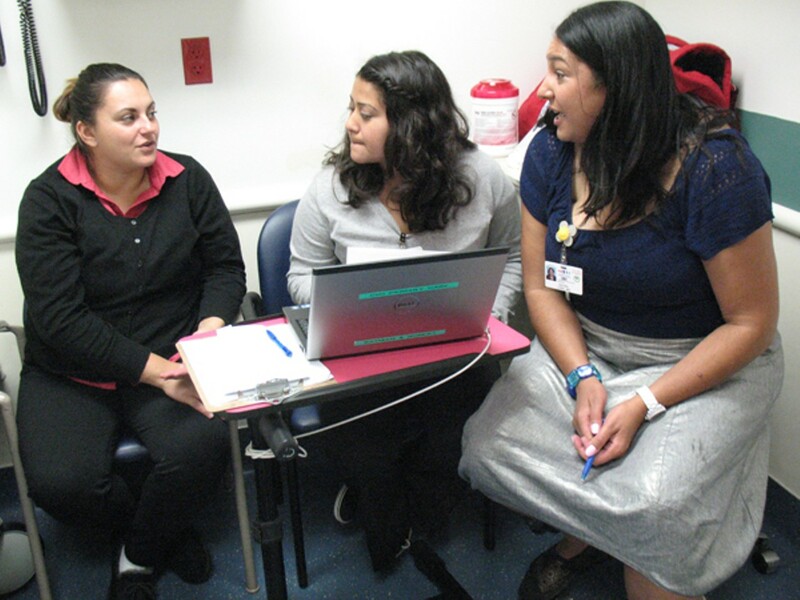 Hayward resident Alicia Ruelas gets assistance at Children's from Jessica Castro and Dayna Long. When Hervey Luster lost his disability benefits from the Social Security Administration earlier this year, his health problems worsened. The 59-year-old Berkeley resident suffers from congestive heart failure and high blood pressure — and the stress of losing his benefits took a further toll on him. "I don't know how I am going to pay rent, how I'm going to eat," he said. Luster's needs, in short, extend far beyond his medical issues. And in many ways, his current financial challenges and the difficulties he's had navigating the federal bureaucracy are intertwined with his health woes. "They're saying I can work while my doctor is saying I can't," he said of social security representatives. Since this spring, however, Luster has been receiving extra help at Oakland's Highland Hospital, the largest campus of the Alameda Health System. As a participant in the new Highland Health Advocates program, he has been working with volunteers stationed at a "help desk" inside the lobby of the hospital's busy emergency room. Since March, these so-called "navigators" have been working one-on-one with patients on larger obstacles — such as access to food, housing, and health insurance — that overwhelmed doctors and social workers don't have time to address. The initiative is part of a new Bay Area trend involving several health institutions that are hoping to shift the way hospitals and clinics deliver care to the urban poor — by proactively tackling social needs in medical settings. Children's Hospital Oakland launched two pilot programs earlier this year and is pushing forward this month with full-time help desks in both its primary care clinic and emergency room. A group of doctors, social workers, lawyers, and officials affiliated with Children's Hospital, Highland, San Francisco General Hospital, and several government agencies and academic institutions make up the Bay Area Regional Help Desk Consortium, which is dedicated to implementing this kind of social support within health-care settings. The overarching concept is based on the simple logic that primarily treating the symptoms of disease is inadequate and does little to keep patients from returning to the hospital with the same or worse health problems. "The way we are practicing medicine doesn't address any of the social and environmental issues that patients have," said Dayna Long, a Children's Hospital staff pediatrician and co-director of the Family Information and Navigation Desk (FIND) program. "You really need to start upstream. ... We need to start thinking about poverty as a vital sign." Although it's widely accepted that social determinants, like stable housing (or lack thereof) directly impact health outcomes, there are few health-care services that target these factors. That's often due to staffing limits, lack of awareness of available resources, and poor technological capacity for cross-agency communication. Health Leads, a Boston-based nonprofit organization founded in 1996 and modeled on the philosophy that basic resource needs should be a standard part of care, has brought social welfare advocates into medical institutions on the East Coast. There are also established "medical legal partnerships" around the country that have integrated legal services into hospital facilities. The Bay Area consortium, however, is the first of its kind west of the Mississippi River and is led by staff from participating institutions. Under the program, volunteer navigators handle basic needs — like helping patients fill out housing applications or directing them to food pantries or emergency shelter. And in cases in which patients have more serious needs, the navigators or medical staff directs the patients toward licensed social workers and qualified attorneys. The participating Bay Area hospitals have been working on the project since early 2012, securing funding from several sources. Children's Hospital, through an Oakland-based organization called the Regional Asthma Management and Prevention (RAMP) program, received $185,000 in federal funds from the Centers for Disease Control and Prevention. That seed money helped launched pilot help desks involving about three hundred patients. Through a collaboration with UC San Francisco, Children's also received an initial $150,000 grant from the Lisa and John Pritzker Family Fund, which has committed two additional years of funding to both Children's and San Francisco General Hospital. Highland has not yet relied on funding outside of its established budget, but the hospital plans to bring on a coordinator in 2014 with financial support from Alameda County Health Care Services. In the emergency room at Children's Hospital, which launched its first formal help desk last month, navigators communicate with nurses and seek patients they can approach. They then have interested families fill out short surveys through which they identify their top needs. From there, navigators take steps to help patients prioritize and address these challenges. The emergency department help desk operates seven days a week, with four to six navigators a day, each working with three or four families. Two weeks ago, Alicia Ruelas, a 31-year-old Hayward resident, showed up with three of her children — the youngest of whom was not feeling well. She told the two navigators on site that she is currently living in a one-bedroom apartment, where her four children — ages five, six, eight, and fourteen — are all crammed into one room, while she sleeps in the living room. Ruelas is trying to find somewhere else to live, but has not had a lot of luck and has little time to devote to the seemingly impossible process. "The average minimum-wage person cannot afford to live in the Bay Area anymore," she said, as two navigators worked to schedule an appointment for her with the Alameda County Housing Authority. "It's outrageously expensive. My kids are fed up and I don't blame them."